Thick hair is heavy and can be a pain to style, but don’t let that stop you from wearing an elegant updo. Arm yourself with hairspray (this is our favorite drugstore pick) and a lot of bobby pins, and anything is possible. The Gibson Tuck is a Victorian hairstyle that has made its way to the 2010s. Start by pulling your hair into a loose ponytail. Secure it with an elastic a little apart from your head, almost as though you were going to pull the ponytail out. Using your finger, create a hole in the hair between the elastic and your head. Twist the tail of your pony around your finger and then roll it up into the hole you have created. Use bobby pins to secure your rolled hair. The elastic should be hidden within the little nest you created. 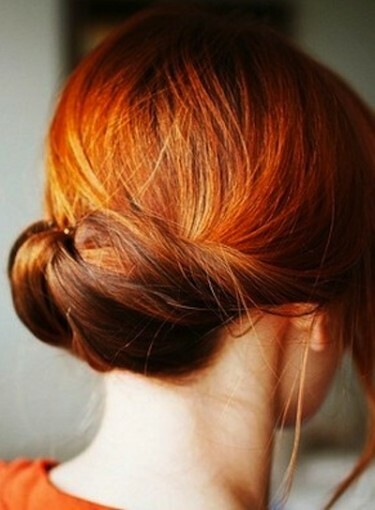 This is one of the elegant updos for thick hair that works for both short and long hair. For short hair, you can roll your hair around a roller and hide the roller in your bun to add more shape to your tucked hair. Leave a few tendrils loose around your face for a romantic look. Although this hairstyle has been around since the early 20th century, it’s now a favorite for the red carpet and a great updo for thick hair. For more inspiration, view our gallery of updos for thick hair.